The Intel 8086 is the original 16-bit Intel Processor. 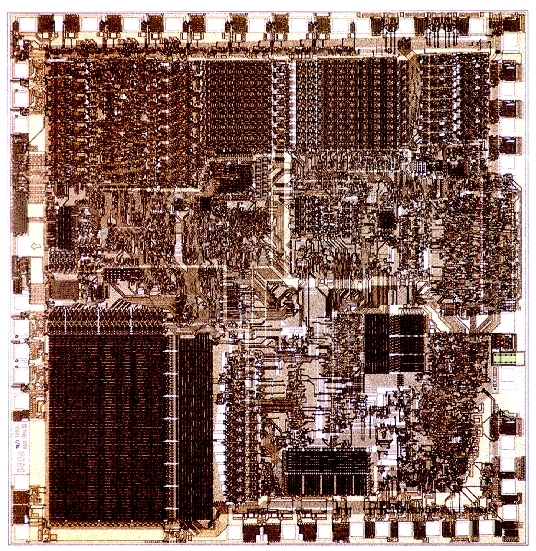 Intel introduced the 8086 and 8088 microprocessor extensions to the 8080 product line in 1979. This chip started the PC revolution and made Intel into a multi-million dollar industry leader. The 8086 and 8088 were binary compatible with each other, but not pin-compatible. Binary compatibility means that either microprocessor could execute the same programs. Pin-incompatibility means that you cant plug the 8086 into the 8088 and visa versa, and expect the chips to work. The new "x86" chips implemented a Complex Instruction Set Computer (CISC) design methodology. The 8086 and 8088 both feature twenty address pins. The number of address pins determines how much memory a microprocessor can access. Twenty address pins gave these microprocessors a total address space of one megabyte (2^20 = one megabyte). The 8086 and 8088 featured different data bus sizes. The data bus size determines how many bytes of data the microprocessor can read in each cycle. The 8086 featured a 16-bit data bus, while the 8088 featured an 8-bit data bus. IBM chose to implement the 8088 in the IBM-PC, thus saving some cost and design complexity. "The Intel 8086, a new microcomputer, extends the midrange 8080 family into the 16-bit arena. The chip has attributes of both 8- and 16-bit processors. By executing the full set of 8080A/8085 8-bit instructions plus a powerful new set of 16-bit instructions, it enables a system designer familiar with existing 8080 devices to boost performance by a factor of as much as 10 while using essentially the same 8080 software package and development tools. "The goals of the 8086 architectural design were to extend existing 8080 features symmetrically, across the board, and to add processing capabilities not to be found in the 8080. The added features include 16-bit arithmetic, signed 8- and 16-bit arithmetic (including multiply and divide), efficient interruptible byte-string operations, and improved bit manipulation. Significantly, they also include mechanisms for such minicomputer-type operations as reentrant code, position-independent code, and dynamically relocatable programs. In addition, the processor may directly address up to 1 megabyte of memory and has been designed to support multiple-processor configurations." At the time IBM introduced the IBM-PC, a fledgling Intel Corporation struggled to supply enough chips to feed the hungry assembly lines of the expanding personal computer industry. Therefore to ensure sufficient supply to the personal computer industry, Intel subcontracted the fabrication rights of these chips to AMD, Harris, Hitachi, IBM, Siemens, and possibly others. Amongst Intel and their cohorts, the 8086 line of processors ran at speeds ranging from 4 MHz to 16 MHz. It didnt take long for the industry to start "cloning" the IBM-PC. Many companies tried; but mostly they all failed because their BIOS was not compatible with the IBM-PC BIOS. Columbia, Kayro and others went by the wayside because they were not totally PC-compatible. Compaq broke though the compatibility barrier with the introduction of the Compaq portable computer. Compaq's success created the turning point that enabled today's modern computer industry. NEC was the first to "clone" this new Intel chip with their V20 and V30 designs. The V20 was pin-compatible with the 8088, while the V30 was pin-compatible with the 8086. The V-series ran approximately 20% faster than the Intel chips when running at the same clock speed. Therefore, the V-series chips provided a cheap "upgrade" to owners of the IBM-PC and other clones computers. The V-series chips were very interesting. These chips were introduced in 1985 at approximately the same time as Intel's introduction of the 80386. The 80386 was still years away from production, and the 80286 was just barely being accepted in the IBM-PC/AT. Even though these chips were pin-compatible with the 8086 and 8088, they also had some extensions to the architecture. They featured all of the "new" instructions on the 80186 / 80188, and also were capable of running in Z-80 mode (directly running programs written for the Z-80 microprocessor).